In 1850, Allen B Wilson patented his designs for a rotary-hook-and-bobbin sewing machine. Then, in 1854, he patented a machine with a four-motion feed for moving the material on after every stitch. 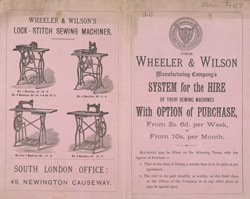 These machines were very popular and Wilson continued to receive royalties from these patents for the rest of his life.